Dr. Maturin had flung his slabs of portable soup into the sea, on the grounds that they were nothing but common glue, an imposture and a vile job. none of the hunters killed any thing except 2 or 3 pheasants; on which, without a miracle it was impossible to feed 30 hungry men and upwards, besides some Indians. So Capt. Lewis gave out some portable soup, which he had along, to be used in cases of necessity. Some of the men did not relish this soup, and agreed to kill a colt; which they immediately did, and set about roasting it; and which appeared to me to be good eating. This day we travelled 17 miles. This entry marks the first use of “portable soup” by the Corps of Discovery. In the spring of 1803, Meriwether Lewis had purchased 193 pounds of portable soup from Francois Baillet, a cook at 21 North Ninth Street in Philadelphia. He paid the princely sum of $289.50 for 32 tin canisters of the stuff. Over the next two years, Lewis and his men had carried, floated, and poled the soup all the way up the Missouri River, without once being tempted to break into it. Now, however, there was indeed a “case of necessity.” The air was cold and snowy, game was increasingly scarce, and the Corps of Discovery was beginning to starve to death. Portable soup was nothing newfangled in the early 1800s. According to Leandra Zim Holland’s Feasting and Fasting with Lewis & Clark, methods for the reduction of meat broth had been around since the 1720’s. Meat (usually beef, veal or mutton) was boiled down into a dense gel in a series of steps that extracted the nutritious components and boiled out most bacterial contaminants. The gel was then air-dried or baked to remove what little moisture was left, leaving a dried slab of soup stock with about the same nutrition as a bouillon cube. The portable soup was intended to be combined with hot water, meat, vegetables, and spices to make a passable meal. However, the Corps of Discovery had none of these things except water made from melted snow. we crossed a creek a pond a little below then assended a high Mountain Some places So Steep and rockey that Some of our horses fell backwards and roled 20 or 30 feet among the rocks, but did not kill them. we got on the ridge of the mountain and followed it. came over several verry high knobs where the timber had been mostly blown down. we found a small spring before we came to the highest part of the mountain where we halted and drank a little portable Soup and proceeded on to the top of the mount found it to be abot. 10 miles from the foot to the top of sd. mount and most of the way very Steep. we travvelled untill after dark in hopes to find water. but could not find any. we found Some Spots of Snow so we Camped on the top of the Mountain and melted Some Snow. this Snow appears to lay all the year on this Mount we drank a little portable Soup and lay down without any thing else to Satisfy our hunger. With game so scarce, the hated portable soup was quickly becoming their only reliable food source. Even the supply of that was dwindling with alarming rapidity. By Wednesday, September 18, Lewis recorded: “this morning we finished the remainder of our last coult. we dined & suped on a skant proportion of portable soupe, a few canesters of which, a little bears oil and about 20 lbs. of candles form our stock of provision, the only resources being our guns & packhorses.” In desperation, the captains decided that Clark would go on ahead with six men, and try to find food to bring back for the rest of the party. Clark’s men found a horse, killed it, and hung it up for the rest of the party to find, then pressed on searching for larger, meatier game. we killed a few Pheasants, and I killd a prarie woolf which together with the ballance of our horse beef and some crawfish which we obtained in the creek enabled us to make one more hearty meal, not knowing where the next was to be found. I find myself growing weak for the want of food and most of the men complain of a similar deficiency and have fallen off very much. 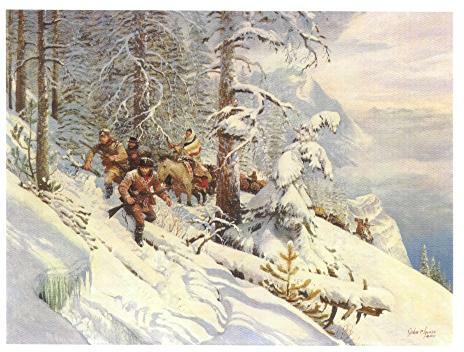 Fortunately, Clark and his men had emerged from the dreadful, rugged mountains, encountered the Nez Perce Indians, and started back with dried fish and roots for Lewis’s starving men. The worst ordeal of the expedition, the trek over the Rocky Mountains, was over. Though it wouldn’t win any culinary awards, the portable soup had served its purpose. Lewis and Clark had enough portable soup left over to give some to a sick Indian chief at the Chopunnish village of Broken Arm during the trip home in May 1806. Surprisingly, the patient not only survived—but actually got well. That portable soup sounds horrible, but I guess it’s your only option if there’s nothing left to eat. Not starving to death is a great motivation to eat even the most disgusting things! I wonder if this kind of soup is a lot like our condensed soup nowadays.